The Highlands was first sighted by Henry Hudson himself and is known as the place where the Jersey shore begins. Its beaches are perennially crowded with sunbathers, swimmers and families. But buried under the sands, the Highlands hides sins from the past. Sandy Hook claimed North America's first European murder victim, a passenger on Hudson's Half Moon. During Prohibition, mobsters supplied Bay Avenue businesses with plenty of booze. A man accused of shooting another with a cannon performed an Old West style jailbreak. And sometimes, soldiers stationed along the shores caused more trouble than they prevented. 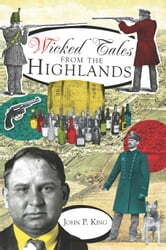 Read about these and other wicked deeds committed in New Jersey's Highlands.